There's good and bad news about driving in Greece. On a positive note: Most people have no trouble driving the main roads of Greece, and there are main roads leading to all of the major tourist destinations. Particularly good areas for road trips are the Peloponnese Peninsula and Crete. Now, the bad news: Greece has the highest car accident rate in Europe, and if you're an inexperienced driver, Greece's roads may not be for you. Car rental fees and gas are both expensive, especially from an American's perspective. Greece is also a mountainous country, and many roads will be curvy, and in late fall and winter, they may be wet, snowy, or icy. 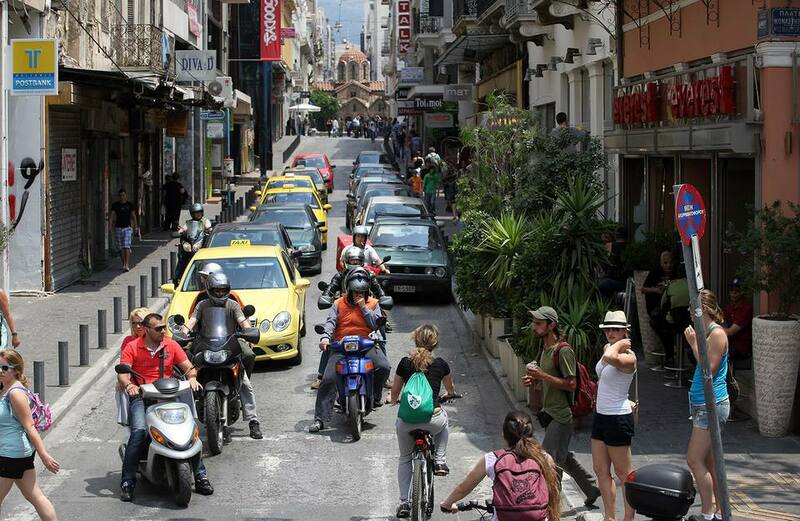 Additionally, Athens' traffic and parking in Athens can be a nightmare. If, however, you still want to rent a car and tour Greece with the comfort and ease of driving between popular tourist destination, there are fortunately a number of great car rental companies you can use, or, if you have the money for it, you could potentially buy and later resell a used car if your trip is expected to be longer than a month. A good option for small groups is a minivan like the Nissan Serena, but these and other minivans have low luggage capacities, and although they can technically take up to eight passengers, they can hold only a few bags. For this type of minivan, you should err on the side of estimating five or six passengers to accommodate for extra space your luggage will require. Of course, if you are only using the vehicle for day trips, this shouldn't be as much of a problem, though the drive to and from the hotel may be memorably uncomfortable. Four-by-fours and off-road capable vehicles are popular choices for many travelers, but the major international rental companies like Ace Car Rentals don't really offer an option for this type of vehicle. Instead, you'll need to book through Greek companies like Kosmo's Car Rental, which offers a variety of off-road touring SUV brands like Jeep and Nissan. If you are accustomed to an automatic transmission, try to get an automatic vehicle, though these are relatively scarce and more expensive. Learning to drive a stick shift for the first time on Greek roads is not recommended. Unfortunately, an Opel Astra is often offered as the only automatic-transmission choice. Take the offered insurance coverage, and if you're uncertain whether or not your regular policy covers travel in Greece, it's wise to double-check. Not all of them will, and it's an expensive mistake to make if you do have a problem. When you rent a vehicle in Greece, the quoted price will usually NOT include the VAT tax of 18 percent and the 3 percent to 6 percent airport rental tax. To be safe, allow about 25 percent extra to cover these costs. Also, the listed prices for rentals usually exclude the summer premium—allow 10 to 15 dollars a day extra for rentals from June through September. The actual "premium" dates will vary by the provider. For United States residents, the "mini" and "economy" offerings will usually be too small both physically and psychologically for your vacation needs—stick with "Compact" class and up for comfort and room, though they will be more of a challenge to park. Many of the gas stations are the BP chain, with clean, big stations, good toilet facilities, and a few snacks and other items such as maps. Silk stations and even the occasional Shell are also found along the highways. However, gas stations are not that common, so take advantage of them when you see them, and also be aware that many of them are closed on Sundays. If you're having trouble finding a gas station, stop and ask; locals will usually know which ones are open! Are There Sharks Near the Greek Islands?